1. Cut the butter into cubes and place in a small saucepan with the milk. Heat on low until the butter is completely melted, then set to one side to allow the mixture to cool for a few minutes until lukewarm. 2. Place the flour into a large bowl and add the yeast to one side of the bowl and the salt to the other. If you put the salt directly onto the yeast it may kill it, and the dough will not rise. 3. Beat the eggs into the milk mixture (it should feel just slightly warm to touch). Gradually add this into the dry ingredients, stirring all the time, until a sticky dough forms. You may not need to add all the milk mixture – just enough for a sticky, but not wet, dough. 4. Turn the dough out onto a lightly oiled surface and knead for 10-15 minutes or until no longer sticky and it has become a smooth and elastic dough. Alternatively, knead using a stand mixer fitted with a dough hook attachment. Place the dough into an oiled bowl, cover with clingfilm and leave for 1-2 hours or until doubled in size. 5. 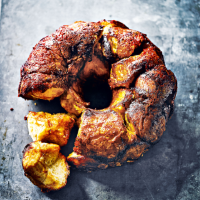 Grease a large bundt pan (or savarin tin) with butter. For the coating, melt the butter and Marmite together in a small saucepan over a low heat until combined, then remove from the heat. Turn the dough out onto a floured surface and divide and roll into small balls. Aim to make 25-35 – they don’t need to be equal in size. 6. Roll each dough ball in the Marmite butter, then in the grated cheese. Randomly scatter the balls into the bundt tin, trying not to squash them down. They will touch and stick together as the dough proves. Tip any remaining butter mixture and cheese over the dough, then cover the tin and leave to rise for 1 hour. 7. Preheat the oven to 200°C, gas mark 6. Bake the monkey bread for 30-35 minutes until well risen and golden. The top will be golden brown and the cheese bubbling. Allow the bread to cool for 5 minutes in the tin, then invert onto a plate and tap sharply before lifting the tin to remove the bread in one piece. Serve as a delicious centrepiece starter or accompaniment to a meal. Fill a bowl with plain popcorn (from a packet or freshly popped). In a small saucepan, melt 1 tbsp butter with 1-2 tsp Marmite. Pour into the popcorn and toss to coat. Eat immediately. Add a spoonful of Marmite to meaty dishes like Bolognese sauce, shepherd’s pie or chilli con carne for a savoury punch and a huge flavour.